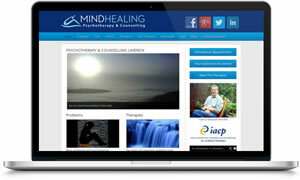 Limerick based Psychotherapist and Counsellor Cóilín Ó Braonáin approached us to build a new website to strengthen the online presence of his psychotherapy practice. Cóilín was keen to be able to manage the website himself on an ongoing basis so the WordPress content management system fitted the bill perfectly. Aswell as delivering the new feature-rich website, we also designed a new logo for the Practice and included a number of SEO features aimed at ensuring strong Google search engine visibility.